This article investigates the time of life when the current position of Saturn exactly corresponds to the placement of Saturn in the birthchart. 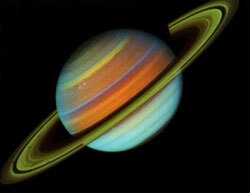 From ancient times, Saturn has been known as the planet of karma. It represents the tests and boundaries of physical existence. Every soul has to come under this discipline and instruction in order to evolve from self-centredness to a recognition of universal kinship. Saturn describes the conditions the soul has accepted and is working through within the practical earth experience. It is also where specific karmic duties and responsibilities are highlighted, and so can show where feelings of inferiority or self-consciousness affect us. More astronomical photographs may be found at the NASA stock photos website. In the chart, Saturn themes include coping with physical needs and dealing with the consequences of previous actions. It is where the soul is held to account - for good or for bad. It is the highest moral planet, indicating character, principle and integrity. The positive qualities associated with this planetary principle are the capacity for hard work, self-control, patience, endurance and discipline. When working at its highest potential it confers a strong sense of responsibility, commitment, reliability and rectitude. Here the soul can bring order, structure purity and a sense of serenity to all its endeavours. At the other end of the spectrum, when the faulty action of the planet holds sway, then restriction, limitation, sadness and struggle can ensue. It can manifest in the outer life as a mean, selfish, narrow-minded or unrelenting temperament, or through a life of severity, sorrow or ill-health. Saturn in the chart is also related to fear. In fire signs, this can manifest as a lack of confidence or sense of purpose, and in an earth sign, fears relating to money, security, health and well-being can occur. In an air sign there can be an inability to communicate the deeper thoughts, whilst in a water sign, the soul may experience certain difficulties in self-expression. The qualities too give some clear pointers of the lessons undertaken in the particular incarnation. When Saturn is cardinal, the soul may tend to hold itself back, in fixed signs, there can be wilfulness and rigid habit patterns, and in mutable signs, negative thinking, worry, or prejudice may have to be overcome. In forecasting, Saturn is concerned with consolidation, responsibility and structure. Its issues relate to the physicality of the material plane and to confronting the effects of past actions. At its highest, it draws out the patient, diligent and conscientious side of the nature. It confers organisational ability, care with detail, and is concerned with the wise and constructive use of time. It can also motivate steady progress towards a desired goal. This emphasis is extremely favourable for inspirational ideas, and especially for bringing them into practical manifestation. Saturn transits shed light upon the way you see and experience the world. They help you to understand what you want at the deepest of levels as well as showing areas of life that are being tested and examined. These transits can be viewed as an opportunity for gaining insight and self-awareness. The challenge is to look at yourself and your reactions in order to make changes for the better. As Saturn moves around the natal chart, it shows where energies and behaviour patterns are being challenged. If these challenges are welcomed and worked with, then it will bring form and cohesion to the area of life indicated. On the other hand, if they are resisted, it can bring unwelcome changes and sadness. The Saturn cycle is 29 years - this means it takes 29 years for transiting Saturn to make a full cycle of the chart and so return to its natal position. During this period, it will move through each house, and in turn will activate and stimulate each planet, angle and point in the chart. Due to retrograde motion, there can be three exact conjunctions to its natal position. When natal Saturn is direct, the first direct Saturn return can be used, if it is retrograde, then the first retrograde return can be chosen. A chart can be set up for the return time and mapped back to the radix. This can be very helpful in seeing the potential life direction for the next phase of experience - that is, the next 29 years. It can also be helpful to explore how well the person is adjusted to Saturnian matters in their life. "It is important to appreciate that the exact Saturn Return is not a stationary event, but a moment within a continuous cycle." It is important to appreciate that the exact Saturn Return is not a stationary event, but a moment within a continuous cycle. Though it can be a major turning point in the life, it is part of an ongoing life process. The entire period can be seen as a landmark in the life. In the months leading up to the exact conjunction there is often a strong impetus for change. It is an opportunity to take stock of the present circumstances, to re-evaluate them, and hence to see where progress and improvement can be made. Aspects of the life that may have seemed unsatisfactory or unfulfilling can be examined and plans to better them can be made. Essentially, the Saturn Return is a maturing influence. It can be seen as a new phase of activity, a time to let go of the things in life that are no longer rewarding, and to embrace the new phase of life that is just about to begin. The challenge is to see this process as a necessary preface - clearing the way for new growth and progress, taking control and setting up the life in a realistic and practical manner. If this is not done, then feelings of loss could ensue. This is a period in the life when the person is being urged to accept the repercussions of the past. How this manifests outwardly will depend upon how well they have coped with the whole Saturn cycle. For some, it could be a somewhat unsettling experience as restrictions are felt, or a realisation of unreal expectations dawns. For others, it can be most rewarding, a time when an increase in responsibility and stability can be welcomed. Either way, an urgency to achieve, to do and to experience can be apparent as the theme of hard work and effort is highlighted. It can also show times of striving in the search for awareness. Because many inner and outer changes are likely, it can give rise to an abundance of questions. This is a time to be true to the dictates of the heart, and to discern if you have been living up to your own standards and ideals. Even if you feel you have not achieved your aims, this can still be a very positive experience, as it can help you to re-view the situation and define necessary changes for future success. By determining which structures in your life you want to concentrate upon, it can be a wonderful impetus for energy and growth in those particular areas. The outcome can be constructive changes in relationships, in the home or in work, as well as in attitudes and aspirations. Due to the length of the Saturn cycle, most people are likely to experience two returns in a lifetime. For a few long-lived individuals, a third return can also occur. This offers the opportunity for a second - or even third - chance to more closely align to the energies of this planet. The first Saturn Return occurs at around the age of 29 years. This can be a true milestone age, when you are being urged take on the full accountability of adulthood. It is a time to view things in a more mature way, to let inappropriate things go, and to build your life around the activities and pursuits you are best suited to. As can be seen, this is a time of endings and beginnings, and of defining new boundaries. If this is done agreeably then the consolidation of your plans is likely. If not, then you may have to make some adjustments to your expectations. However you respond to these challenges, the way is being paved for new responsibilities to be shouldered as you move into the next cycle. It would be helpful to adopt as open an attitude as possible so as to avoid becoming too entrenched in ways, opinions and views, otherwise the challenges of the next Saturn Return at around 58 years will be more difficult. "Essentially, the Saturn Return is a maturing influence. It can be seen as a new phase of activity, a time to let go of the things in life that are no longer rewarding, and to embrace the new phase of life that is just about to begin." The second Saturn Return is unlikely to be quite as powerful as the first one, as by this point, many years of life experience and knowledge can be drawn upon. The effects of this second return will depend upon how successfully the first return was handled. The challenges of this period include having to face up to different responsibilities, often incorporating retirement, and to release the things that no longer support your life purpose. At best, it heralds a rewarding time when you can appraise what you have already accomplished, and make effective plans for the rest of your life. Making some appropriate changes may be necessary to ensure events work out in the best possible way. On the other hand, this could be a testing time for those who feel they have not achieved the things they set out to do. Accepting that youth has passed, or realising many opportunities may have been missed might not be easy facts to face. Some people may experience a third Saturn Return at around 87 years. During this time the past is likely to come under close examination. It can mark the beginning of a process during which old boundaries and expectations can be broken down and discarded, and past accomplishments and plans consolidated. When studying a Saturn Return, there are three important points to consider. The first two can be taken together - Saturn is transiting a particular house; at the same time natal Saturn is receiving a transiting conjunction. The third fact to think about is how this configuration is likely to affect the particular individual. Look at the sign, element, quality and rulership of Saturn in the natal chart to ascertain the likely reactions, emotional response and mental attitude. This will help to determine where the changes and responsibilities represented by the return will be likely to occur and therefore the life lessons it represents. With Saturn in the first house, the soul is being urged to understand and develop the will and to focus on purposeful activity. The challenge the return offers is to turn the attention inwards, to review ideas, ideals and objectives, and to get to know and accept yourself as you are now. In the second house, issues relating to security are important - both in a material sense, and through personal values and self-worth. The return period can help to define and perhaps restructure your valuing system, and so enable you to make the best use of the resources at your disposal. A natal third house Saturn suggests an inner striving to discover a personal truth. The task of the return is to examine how your habitual attitudes, mental habits and patterns operate and come across to others, and then to make any necessary adjustments to more clearly impart them. The fourth house indicates the soul is working on building an inner sense of security and self-acceptance at a very deep level. In particular, the return offers a chance to actively deal with any disharmony or unresolved issues concerning domestic arrangements and family relationships. A fifth house Saturn is connected with the understanding and unfoldment of creativity, and the capacity for conscious love. The return presents an opportunity to unlock this innate creativity, both through examining your feelings towards others and by giving form to your inner potential. Learning the interconnection between mind and body, and that service is a quality of the inner person, are lessons of a sixth house Saturn. The return period is a good time to look at your duties and obligations, work and health practices, and implement new constructive and efficient ones. With Saturn in the seventh house, the search for inner wholeness can be a strong motivating factor. Lessons of the return period include understand the nature of your relationships, your expectations and those of other people. The focus is on personal and professional interconnections. In the eighth house, issues relating to emotional expression and to deep spiritual matters are highlighted. The return indicates a time to look at your life and to decide where transformation is needed. It may present challenges and lessons to help the soul to rely upon its own resources. A natal ninth house Saturn suggests an inner search for a personal framework of spiritual and moral values and experience. The return is a period when the outlook can be stabilised. By remaining open, the soul can gain a deeper understanding and acceptance of itself and of the world. The tenth house indicates a drive towards constant effort to demonstrate usefulness and value through achievement. The focus on external affairs can be very strong during the return period as there is the potential to express your individuality through your work and accomplishments. An eleventh house Saturn is connected with the sense of commitment to and participation with other people. The task of the return is to integrate your personal hopes, dreams, ideals and objectives with those of others, and to learn to work and co-operate in team efforts. This article was first published in the Astrological Journal 'Altair' in August 2003. The power to serve with responsibility and detachment is the aim of a twelfth house Saturn. The return is a time when solitude may be sought in order to understand what you have or have not accomplished and for discerning where changes in relationships and situations can be made. The period of the Saturn Return is essentially a time when the old and inapplicable can be dismissed in readiness for a new phase of experience to begin. Elements of the life that are no longer suitable or fruitful can give way to new and more productive activities and circumstances. The trick is to keep positive, to look ahead and not backwards, and to see tests and challenges as potentials for growth, progress and enhanced self-awareness.